My brief rant, that I think ties into you not completely feeling the finale … how are you going to spend the entire book separating a certain character from everyone else, and then expect me to care when they die? I guess it is the failed journey that is a gut punch, but still. I love Luna and I love to hate Umbridge. Book 6 and 7 are my faves. I cared, but I cared for Harry, which I think you and Garrett talked about. Looking forward to the last two books! One thing I felt like Rowling totally nailed in this book was the impotent rage that so many teens feel – the powerlessness as things fall to bits around them. I felt that way when I read the book, and it’s the sign of a great author that they can evoke the same feelings in the reader that their character is experiencing. I really do think Dumbledore was acting in Harry’s best interests to not tell him everything when he was just thirteen. That’s a heavy burden to bear, and I wonder if he’d have fought so hard in the graveyard had he known it had to be him or Voldemort. I look forward to reading your thoughts on the sixth and seventh books. Umbridge is a pivotal character and indicative of human fallibility, in my opinion. Keep reading. It might not be quite what you’re thinking. 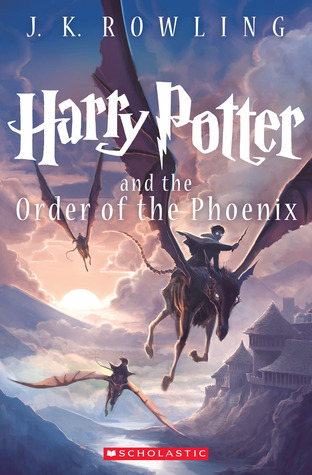 I love all the Harry Potter books, but Order of the Phoenix is definitely my least favorite. I always feel it’s the least satisfying “end of book battle”, because the pages leading up to it just bore me. When I was younger, my main problem with the book was how annoying Harry was being. That doesn’t bother me anymore(because he’s fifteen now & just gone through a great trauma! ), but I think it could have been at least 100 pages shorter. I tend to skim it on my re-reads. Yeah, I think Harry being annoying is totally justifiable. He was kind of that way in Goblet of Fire too, though without the screaming at Dumbledore. I could understand wanting to skim this one during rereads, it really is long and probably didn’t need to be quite so much. Yay, it’ll be fun to fun to talk about the series as a whole as an adult and a newbie! This was also one of my least favorite of the books for the same reasons you named. That mirror scene at the end really bothered me…in fact, why the hell didn’t they use the map and the cloak of invisibility more often. But I really did love the scene where Dumbledore takes out the Minister of Magic, Umbridge, and pretty much everyone else on the opposing side in his office. The movie felt shorter to me, too. I like the added scene with Luna in it, but I feel like the movie as a whole felt more like a summary of the book than it did as its own personal art form. The lady who played Umbridge did a fantastic job, but otherwise this is one of the movies that I feel could have been expanded even by about five minutes to keep some more of the fun and life in it. I really wanted to see more of the school feuding against Umbridge to get more satisfaction. I feel that way about all the movies, honestly, even when they clock in just under 3 hours. It’s like they really can’t capture the book. Goblet of Fire has come closest to me, so far, for being able to stand on its own. Oh goodness, there is so much in these last two books, isn’t there?! Is this your first time through the series or is this a re-read? It’s actually my first time! You’re in for a real treat with the last two books! My two favorites! I can’t ever decide on a favorite for Harry Potter, and I don’t want to. I read it over my childhood, and each books holds such a special place in my heart. I’ve got fond memories of rereading the books up to my latest purchase; I took forever to buy the 7th. I have such a love for the series as a whole and I can’t choose a favorite. I don’t remember this book a ton but I remember not liking Harry much at all because he’s so angry the whole time. And not liking Dumbledore because he’s so circumspect. But I did like Snape a little bit with the whole occlumency thing. This is my least favorite movie, though. It is too short! And actually it is on purpose. This is the first time David Yates directed and he actually said it was his goal to make the shortest Harry Potter film. He didn’t understand that people watch these movies because they want to be immersed in the world – they like longer films! He directed the next three very well but I wasn’t thrilled with this one. I can’t remember how I felt about this book as a whole, despite me having reread it within the past year. I do remember this being kind of a pivotal book in which we get to see flaws and angst and a glimpse of the true terror that is about to come. The movie is actually what made me want to read the books. I remember going to see it and coming out of it feeling very confused like I had missed something. Still not my favorite of the movie series, but it makes a lot more sense now that I’ve read the book series! 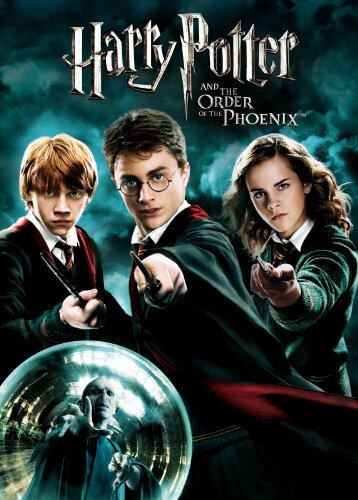 “Order of the Phoenix” was never my favorite book OR movie (it’s definitely my least favorite movie) but I’m actually listening to it on audiobook right now and I like it so much better. I haven’t read the book in a while, and I think I dislike the movie partly because I find Umbridge so despicable and annoying. I feel like she’s not quite as center-stage in the book version. I don’t normally like audiobooks, but the HP ones read by Jim Dale are fantastic! A co-worker (and fellow Potter lover) kept talking about them, so instead of doing a re-read of the series I decided to listen to the audiobooks and it was definitely the right decision! It’s almost like re-discovering the books — and listening to them (with all the amazing voices Jim Dale does) puts a whole new perspective on the stories. I’ve heard good things about the HP audiobooks! Glad you’re enjoying listening to them for your reread!